The Web is still getting acclimated to the team while some question The Shield's leadership. Meanwhile, Dr. Ipph oversees a bloody and ancient ritual to summon a great evil to the world. Will the team come together in time to defeat their greatest challenger thus far? It would be a shame to miss this burgeoning fun series from Dark Circle Comics. It would be easy to miss too which is why I hope you'll indulge me as I pontificate a little. I'll spare you the less than glorious publication history of 'The Mighty Crusaders' from Archie Comics' various imprints over the last 50 years and a licensing deal with DC Comics during the 1980's. Suffice it to say, the colorful superhero team of Archie's answer to the Justice League and the Avengers never got the long run they might have deserved. Archie's Dark Circle Comics is trying to change that but it won't be easy despite being an entertaining and great looking comic. Archie tried to relaunch the Dark Circle imprint with reimagined legacy characters and talented artists and writers a couple of years ago. The problem was The Black Hood, The Shield, and The Hangman didn't exactly light the world on fire. The biggest success was The Black Hood by Duane Swierczynski and Michael Gaydos. Its last issue of volume two, #5, was released in June of 2017, and the longest run of any of the relaunched titles. Frank Tieri and Felix Ruiz's The Hangman was a four-issue run and The Shield from Adam Christopher, Chuck Wendig, Greg Scott, and Kelly Fitzpatrick stumbled its way to four issues hampered in part by delays. What started with some anticipation and excitement about the more gritty and adult side of Archie failed to impress. 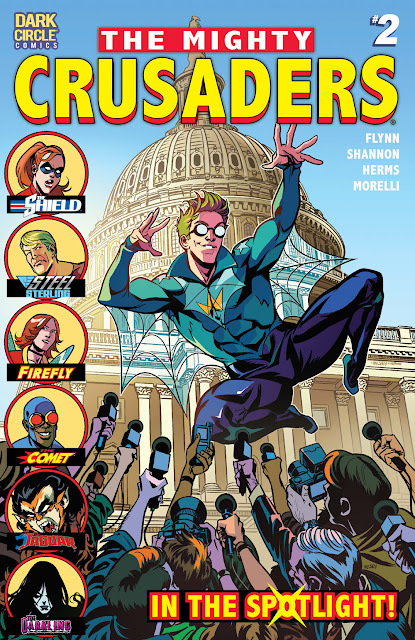 This brings us to 'The Mighty Crusaders' featuring a team of reimagined legacy heroes including The Shield. It's brightly colored with old-school-style line-up covers and thanks to veteran Archie Comics writer, Ian Flynn, this series has gotten off to a great start relying on some fantastic heroics but it's mostly character-driven. Apart from saving the day from crazy villains, the series thus far has been about teamwork, camaraderie, and leadership. When The Comet felt burnt out leading the team The Shield was tasked to take the reins on a trial basis. Unfortunately, she's used to working on her own so the transition isn't going smoothly. Her harshest critic has been Firefly and while that conflict isn't completely resolved it is approached in a mature manner. Meanwhile, on the island Nea Kameni in the "Temple of Doom" possibly, the mad doctor is summoning a giant powerful evil through a ritual that requires human sacrifice. It's a nice signature villain moment that promises to be a problem for our heroes. The scene walks the line between camp and seriousness but it totally works. In fact, this type of throwback to pulp comics, precisely what inspired the Indiana Jones movies, is a nice respite from intergalactic bad guys currently on the stands. The art from Kelsey Shannon and Matt Herms is clean, colorful and compelling. From bold layouts with big panels to the plethora of colors that make up the eclectic costumes, 'The Mighty Crusaders' is the farthest from grimdark you can get without going cartoony. It's really pleasing to the eyes and because there's so much intrasquad drama, Shannon displays so many of the characters' emotions and attitudes with some subtle and not-so-subtle gestures and expressions. This isn't something we haven't seen before with the aforementioned teams from the Big Two but 'The Mighty Crusaders' is so well executed it stands on its own. If Dark Circle Comics is to succeed it needs to develop more comics like 'The Mighty Crusaders' and ensure it's available every month and on time. I'd recommend this to anyone but the publisher has to do their part. With great fun adventures and relatable diverse characters, 'The Mighty Crusaders' is everything a comic book fan wants and frankly what the industry needs to attract new readers. This is A-plus material, a must-buy, and worth putting on your pull-list. Thank you for reviewing this comic. It's also up to readers to buy it. As far as the 2015 attempt, there was also a Web that was all ready to go but never even came out.